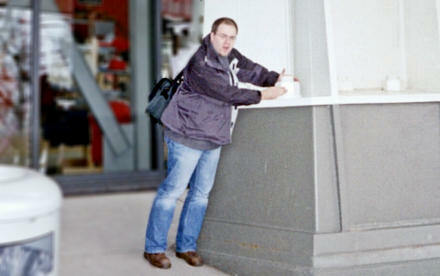 Gareth holding a giant nut at the foot of the Seattle Space Needle in 2004. I’m still here, don’t worry. I took a look at my blog this morning and was surprised to see that I’ve not written anything since Tuesday. There is a reason. I had that incident with my BT Broadband connection. All is resolved now, thanks to BT’s excellent customer care. I created and uploaded the Glenalmond 2007 (summer youth camp) poster and leaflet to the Scottish Episcopal Church‘s website. On Thursday evening Jane and I spent a wonderfully enjoyable evening at the house of the University chaplain, The Revd Dr Jamie Walker, in the company of Jamie, his wife Sheila, Dr Charles Warren and his wife Sarah. Charles had preached in the chapel a few Sundays before I did. I was fighting an infection… And oh! what an infection. At the beginning of the week I began to feel mildly unwell, experiencing amongst other symptoms a dull pain in my groin. I simply assumed that I’d ‘caught myself’ while cycling at the weekend. By Wednesday I was beginning to feel particularly groggy and was finding it difficult to concentrate. “I’m just over-tired,” I thought to myself. On Thursday I stayed at home to concentrate on some HTML coding without the office distractions getting in the way. At lunchtime I thought it might be prudent to make an appointment with the GP, just in case I got worse. The soonest they could see me was Tuesday lunchtime. My stay-at-home-to-work strategy worked particularly well, except that I’d worked solidly all day and hadn’t really got anywhere: my code still wouldn’t work and I was beginning to find it really hard to concentrate. By 4:00 pm I had confined myself to bed as I was sweating and shaking quite dramatically. “Hmm,” I thought to myself, “I suspect that I’m fighting an infection.” The dull pain in my groin was turning into quite a sharp pain by this point and Jane prescribed me a dose of Nurofen with paracetamol. I slept off the shakes, the painkillers reduced the pain and swelling and we went out to dinner. On Friday I felt even more muddled and called the GP. They could see me at 14:50. At 15:45, after a fifty-five minutes wait, I was seen by a doctor who confirmed that I had epididymitis: a bacterial infection of the epididymis. Which in layman’s terms means this: I have an infection that makes me feel as though I’ve been given a mighty kick in the nuts! It’s seemingly not the most common of conditions, but the presence of a kidney condition makes it more likely that I contract this ailment. Which might explain why this is the fourth time I’ve had it in five years. Because of the kidney disease and we’re on the IVF waiting list it was especially important that I got it seen to and was put on antibiotics as early as possible. 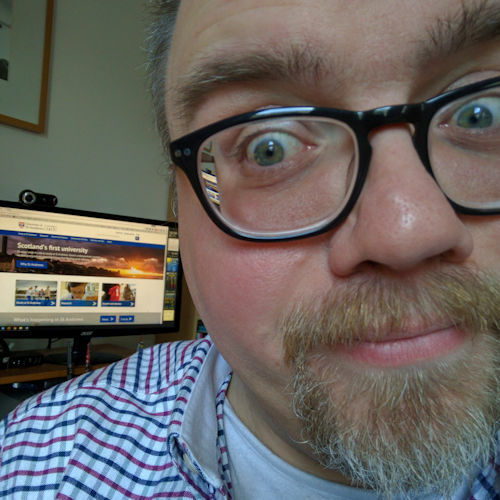 Three days and four pills (Ciprofloxacin (500mg) – one to be taken twice each day) later and the pain is now beginning to subside, my head is becoming less foggy and I can concentrate on finally getting my HTML/CSS code to work properly.